JIPMER Director S C Parija said, approximately 1,89,663 students have registered for the Entrance Exam. The JIPMER MBBS Online Entrance Exam 2017 will be conducted in 339 centres in 75 cities across India. This Online Exam is hosted by Jawaharlal Institute of Postgraduate Medical Education and Research (JIPMER) on 4th June 2017 to provide admissions into first MBBS course for the academic year 2017-18. 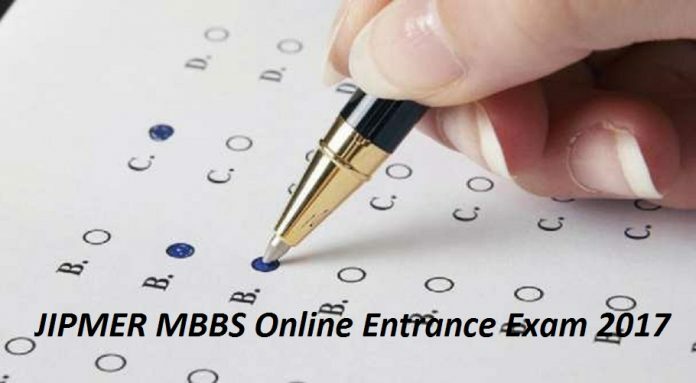 The MBBS (Bachelor of Medicine and Bachelor of Surgery) entrance test will be held in two shifts. The Morning Shift is from 10:00 AM to 12:30 PM and the Afternoon shift is from 3:00 PM to 5:30 PM. In the morning session 83720 students are going to appear the test, and in the afternoon session 1,05,943 students will appear. “Candidates have to follow the JIMPER Medical Exam Instructions carefully. The Examination centres will open at 8 AM. The gates will be closed at 9:15 AM and 2:15 PM. Students arriving after 9:30 AM or 2:30 PM will not be allowed into the examination hall”, Parija said. JIPMER MBBS consists of 200 seats, and 54 seats will be reserved for Puducherry branch. In Puducherry, the JIPMER MBBS Online Entrance Exam 2017 will be at six centres, and 1861 students will appear the examination. Students have to carry on ‘Aadhar Card’, ‘Pan card’ or ‘Passport’, which is considered valid ID Proof for the examination. Parents will not allow into the exam venue and advised to stay away from the test centres. Biometric attendance and photography of the students will be captured to prevent impersonation. CCTV coverage and jammers are deployed to find out erring students. The JIPMER MBBS Result 2017 may declare on or before June 19th, 2017. Soon after uploading the rank card the first round of counselling will start from June 27 to 30. The second counselling tentative dates are on July 19. The MBBS courses commences on July 5.